Uno Blast is one of the most fun versions of Uno, along with Uno Attack. It features an electronic Card Blaster that instantly makes the entire game unpredictable and therefore, more fun to play. The goal of the game is still the same, to get rid of all your cards and reach 500 points (or whatever number agreed upon). But how the game progresses is largely dependent on the mood of the Blaster! The Card Blaster is powered by 3 AA alkaline batteries. Remove the battery compartment on the device bottom with a screwdriver, and insert the batteries, turn the power switch on, and you’re ready to go. Bear in mind the device goes into sleep mode after 3 minutes of inactivity, so make use of the Reset button – press it to turn the Blaster back on, or whenever you start a new round. Top Row, left to right (Draw One, Reverse, Discard Color). Bottom Row, left to right (Skip, Wild, Wild Blast). Draw One – Play this card, and the next player must draw one card from the Draw pile and put it into the Blaster. This only requires one card to be drawn, unlike many other Uno versions, which have a Draw Two. Wild – Play a Wild card to change the color of play to any color of your choice. Wild Blast – This is a powerful card to slow down the next player (in turn). When played, the next player must take cards from the Draw pile and insert them into the Blaster, until it triggers a blast. And after the blast is triggered, all the cards shot out must be taken by that player. It could be as many as 4 cards! There are 110 cards, and 2-6 people may play the game. Choose a dealer, who shuffles the cards and deals out 7 cards to each player. The remaining cards form the Draw pile. Turn the top card in the Draw pile to form the Discard pile, and start the game. If the first card happens to be an Action card, pick another one from the Draw pile. 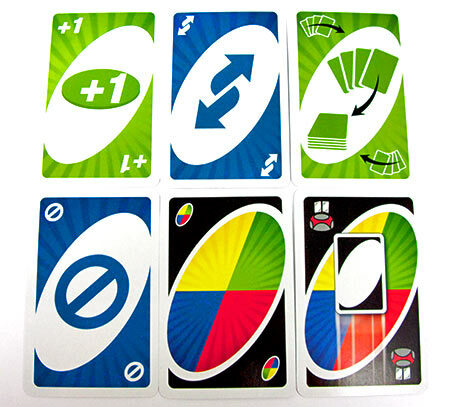 The gameplay for Uno Blast is similar to original Uno, which is to match the cards in your hand with the top Discard pile card, either by color, number, or symbol (Action card). But, here is the catch with Uno Blast – If you don’t have a matching card or even if you have one, but choose not to play it, you must take a card from the Draw pile and put it inside any one of the 4 empty slots in the Card Blaster. If the Blaster doesn’t shoot the card out, you are safe, and play moves on to the next person. But if you’re unlucky and the Blaster shoots the card out on your turn, you must take all the cards that got shot out, and add it to your existing cards in hand. This will slow down your mission of getting rid of your cards! Remember, all solo cards drawn from the Draw pile must be placed in the Blaster on the same turn. Once you are down to your last card, you need to announce “Uno" out loud to your opponents. Failure to do so and being caught for that, will result in you having to take 2 new cards from the Draw pile. If the Draw pile has no more cards left, shuffle the Discard pile and turn it over to form a new Draw and Discard pile again. Wild/Wild Blast – 50 points each. 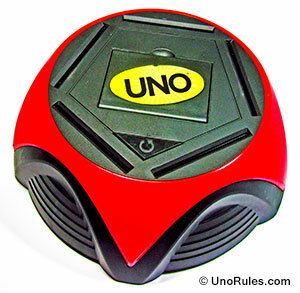 Another way that Uno can be played is to keep a running score of each player’s points at the end of each round. Play Uno Blast as normal, but once someone hits 500 points, the player having the lowest score is the winner.